Pediatric conscious sedation, sometimes referred to as oral sedation, is often poorly understood by both dentists and patients. This is due to the fact that differing levels of sedation are often difficult to describe and can often overlap. In addition, many dentists present themselves as sedation dentists or offering sedation dentistry. More often than not, these dentists describe being “asleep” for the procedure, giving the patient (or their family) the false belief that they will be unconscious for the entire procedure. This simply is not the case. In this article, we are going to explain the difference between minimal sedation and moderate sedation – which if often called conscious sedation. Minimal sedation is also sometimes called anxiolysis. Many people describe using oral sedation as minimal sedation. However, this isn’t quite true. Minimal sedation or anxiolysis is a sedative state where you are able to respond completely normally to verbal commands. This is probably best described at a dental office visit when you receive nitrous oxide or laughing gas. It may also be achieved by taking a normal dose of a sedative such as valium or xanax. It does not cause you to lose consciousness or not to remember the procedure. Conscious sedation is now defined as moderate sedation by both the American Society of Anesthesiologists and the American Dental Association. Previously, Conscious Sedation could include minimal sedation as well, however it now is defined as moderate sedation. In this sedative state, the patient should be able to respond appropriately to repeated verbal stimulation or light touch. For example, a patient under this type of sedation, whether given the medications by mouth or by IV, should awaken and respond to their name or a gentle shoulder nudge. Oral Conscious Sedation is typically performed by the dentist performing the procedure. This is the typical sedation that is offered by both pediatric dentists and many sedation dentists. The dentist will give the patient a cocktail of oral medications to ingest, often about an hour before the procedure starts. These medications then make the patient feel “sleepy” or “woozy” and the dentist may then add nitrous oxide (laughing gas) and perform the procedure once “numbed up.” Other dentists may elect to crush pills under the tongue or provide children with a medicated lollipop. During Pediatric Conscious Sedation, many providers prefer the oral conscious sedation method because the child does not have to have any shots or IVs before the sedative takes affect. 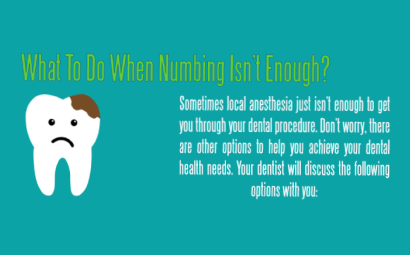 However, the patient will still need local anesthesia (numbing) before the dental work. In addition, the effects of oral sedation can be long lasting, even longer than the procedure time in some cases. Intravenous Conscious Sedation produces a similiar sedative state, but is created by medications that are given intravenously. This can be very successful for adults that are able to receive IV placement and “just need something” to make them less anxious. The benefit of using intravenous drugs is that the drug has rapid effect (minutes instead of 1 hour) and therefore can be titrated to appropriate effect. [icon type=”angle-double-right” class=”fa fa-li accent”]How much work does my child need? How many times do they need to be sedated? [icon type=”angle-double-right” class=”fa fa-li accent”]Who will be doing and monitoring my child’s sedation? [icon type=”angle-double-right” class=”fa fa-li accent”]Will sedation work for my child? [icon type=”angle-double-right” class=”fa fa-li accent”]What options do I have if sedation doesn’t work? Next Next post: Dental Cavities in Children – How Common Is It?